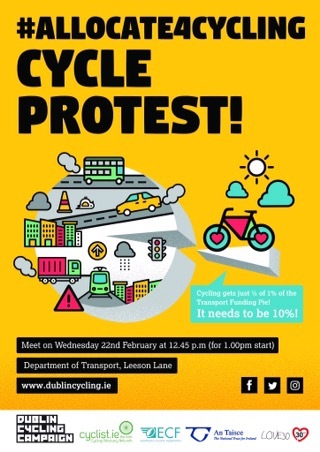 Cycling commuters and others who cycle are expected to stage a lunchtime cycle protest in Dublin today to look for safer conditions for cycling and at least 10% of the transport budget to go towards cycling. The event, which is set to start at 1pm at Leeson Lane, is being organised by campaign groups Cyclist.ie and the Dublin Cycling Campaign. The event’s Facebook page currently shows 200 people going and another 400 interested.